This delightful dramatization explores the variety of relationships that women experience in Shakespeare's plays linked by a single thread, love. Here we see love in all its aspects: love of power, of King, of country, father, mistress, friend, brother. Characters include Juliet, Portia, Isabella, Rosalind, Viola, Constance, Lady Macbeth and several others. Gabrielle adds her own personal commentary, and in doing so reveals her great love relationship with the Bard. A graduate of the Bristol Old Vic Theatre School, Trent Park College of Education, and Concordia University, Gabrielle has had a passionate relationship with the theatre all her life. She has taught drama to hundreds of young people here in Montréal. Gabrielle resigned from her position as a full-time faculty member in the Theatre Department at John Abbott College in order to concentrate full time on Persephone Productions. 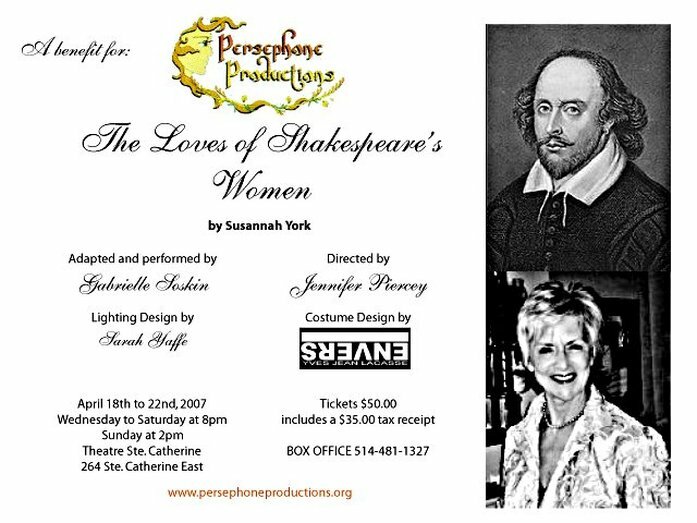 In March 2005, Gabrielle decided to appear in Patrick Garland's dramatization of A Room of One's Own by Virginia Woolf directed by Jennifer Piercey at La Balustrade Monument National as a fundraiser for Persephone Productions' upcoming season. The critics praised Gabrielle's performance. A Room of One's Own toured various high schools and libraries following its sold out run at Monument National. The tour continued to Hong Kong where the prestigous Helena May Institute for Women sponsored a performance for its members and guests. The 2005 fundraising initiative has successfully increased the exposure of Persephone Productions, and contributed towards funding for the production	of A Spring Awakening by Frank Wedekind in November 2005. Jennifer graduated from the University of Calgary with her MFA in Drama, specializing in Directing. Her thesis Love and Family in Michel Tremblay's Bonjour, là, bonjour: A Director's Journey is an exploration of the production that premiered in Calgary in November 2003. She has a BA in theatre from the University of Ottawa and a DEC in Professional Theatre, specializing in Acting, from John Abbott College. She is a member of the Swamp Dweller Dames most recently performing the role of director and co-creator of Hothouse, a solo clown show for adults and featuring dance and puppets. It won Best Original Script, Outstanding Technical Merit, Outstanding Production and Best Female Actor at the 2006 Calgary One Act Play Festival, the Taking a Risk Award at Theatre Junction's 2006 Random Acts Festival, and Honourable Mention at the 2006 Alberta One Act Play Festival. She is very pleased and excited to be working with Persephone Productions and Gabrielle once again after having directed Virginia Woolf's A Room of One's Own and performing in the company's inaugural production of Anna Karenina. Originally from Toronto, Sarah has lived in Montreal for the last eight years where she studied Theatre and Philosophy at McGill University and Technical Production at the National Theatre School. She is currently working at the Centaur Theatre as the Head Technician, but her true passion is for lighting design. Past design credits include "American Buffalo" by David Mamet directed by Andrew Shaver for Sidemart Equity Co-op, "Oops" by John Feld at the 2006 Summerworks Festival, and "Gashlycrumb" directed by Ker Wells presented at the Monument National. Sarah has worked at the Fringe Festival in Montreal and Toronto, the Just for Laughs Festival, the National Arts Centre, and various theatres around town. She is very pleased to be working with Gabrielle and to bring some of Shakespeare's most moving speeches to life. Depuis maintenant 11 ans, la griffe ENVERS par Yves Jean Lacasse bouscule l'industrie de la mode. Le style nuance les coupes traditionnelles et contemporaines en utilisant les asymétries, les superpositions et l'art du fait main. Considéré comme l'une des valeurs sûres de la couture internationale, le créateur se prête au jeu raffiné d'entremêler modernité et passé. Promoteur de la mode québécoise à l'étranger, ses collections homme et femme ont été présentées dans plusieurs villes du monde. Professeur au Centre Textile Contemporain de Montréal, il est souvent invité à donner des conférences sur la formation et la vision artistique de la relève d'ici et d'ailleurs. For the past 11 years, ENVERS by Yves Jean Lacasse has turned the fashion industry upside down. Its style has a traditional and historical undertone, using asymmetry, layering and craft handy work. Considered one of the established values of international couture, the designer combines modernity and the past in a playfully refined way. Promoter of Québec fashion, his men and women collections have been presented in several cities around the world. He teaches at the Contemporary Textile Center of Montreal and gives conferences and workshops to upcoming designers at home, and abroad. Jackie graduated from John Abbott College's Theatre Workshop. There she stage managed the productions of Les Belles Soeurs, by Michel Tremblay; The Day They Let the Lions Loose, by Emilio Carballido; and the John Abbott College Theatre Workshop Alumni Show. During this time, she also performed on the stage in Godspell (Stephen Schwartz), Our Town (Thorton Wilder), Pride and Prejudice (Christina Calvit), and Guys and Dolls (Frank Loesser). This is her second time working with Persephone.